One of Newark's earliest composers was Dr. Abraham Coles, noted physician, remembered by a statue that stands in the northern end of Washington Park. While he is essentially remembered for his scientific accomplishments, he was one of those 19th-century gentlemen scholars who was also attuned to the arts and humanities. Coles began his medical practice in Newark in 1836, the same year the city was incorporated. He was later elected president of the New Jersey Medical Society. His home in Scotch Plains, Deerhurst, was a wonderful place, where both the arts and sciences were treated with reverence. His death brought letters of condolence from Oxford, Cambridge, the Royal Society in London and the White House. Coles is remembered for the voluminous lyrics he composed for church hymns. His Washington Park memorial and pedestal bust attributed the words of the Rock of Ages to him. However, it is not the words of the famous hymn that many of us know, but a more obscure church version. But the bronze plaque on the front of the monument includes some of his words: Let us to Jehovah raise, Glad and grateful songs of praise! Let the people with one voice, In the Lord their God rejoice! For His mercy standeth fast And from age to age doth last. 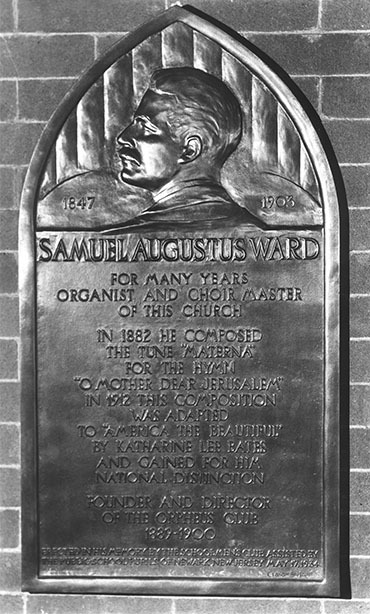 Samuel Augustus Ward, 1847-1903, a noted American composer and musical pacesetter of Newark, was born of old Newark stock. He was descended from both the Ward and Tichenor families who were among the founders of Newark. Ward was educated in the public schools, studied music with Newark Professor Algar, and became the youngest member of the old St. John's Lodge. While he is generally known as organist at Grace Church in Newark and as the founding director of the Orpheus Club, he originally owned a music store at Broad and West Park streets that sold sheet music and pianos. Ward is best remembered for composing 'Materna,' the tune to 'American the Beautiful.' The words were written by Katherine Lee Bates. People often mistakenly attribute the words to Ward. One contemporary friend credited him with writing one of the nation's most patriotic songs, equal in sentiment, and emotion, to Julia Ward Howe's 'Battle Hymn of the Republic.' Ward's admirer went on to state that he had 'caught the popular imagination of the nation's 25 million schoolchildren who daily sang the composition as part of their school exercises.' How appropriate then that when the groundbreaking ceremonies for the New Jersey Performing Arts Center occurred, they included the singing of the great American anthem written right here in town. In 1912, the famous Lauter Piano Co. celebrated its 50th anniversary. To mark the occasion, the 'Lauter Jubilee March' was written by William H. Redgate. While the march had no words, the composition carried a terrific musical punch. The piano company was very successful. Production began in 1862 in a factory across from the Broad Street Station at Lackawanna Place, now part of the Westinghouse Works. Its showrooms were situated at 657 Broad St. Lauter pianos were found in most local schools and houses of worship as well as in homes throughout New Jersey and well beyond. In 1912 the Newark Board of Education purchased 12 grand pianos in a single sale. If you grew up in the Newark area, perhaps your parents or grandparents had a Lauter piano in their front parlor, too. During the last half of the 19th, and first part of the 20th century, various pieces of sheet music celebrated Newark and its diverse population. In the 1850s, an ode to a girl's school graduation was put to music. In another composition, the city's German language population was honored. Additionally, an Austrian march-dance was compiled by Walter Grabau for mandolin, zither, guitar and piano and piano, was dedicated to Any Moritz of Newark, N.J., in 1896. In 1915, just before the outbreak of World War I, Max Flohrschuetz's 'German War Call March' was reprinted by William Flohrschuetz of 662 Bergen St. It was dedicated to H.R.G., the German Crown Prince Friedrich Wilhelm. The piece was considered 'a call that roars like thunder, like swords clashing, and waves thrashing. To the Rhein, the Rhein, the German Rhein.' It went on to plead, 'Dear Fatherland, be calm, firm and loyal stands the guard, the guard on the Rhein.' Certainly, it was a militaristic song if there ever was one, but remember that Newark's German population in 1915 was very large and powerful, and war, although on the verge of being declared, still lacked reality. The profits of this publication went to the support of the widows and orphans of fallen comrades of the first Royal Saxony Grenadiers Regiment, No. 100. While wildly German and patriotic in 1915, the piece would not have appeared in Newark in 1916. By that time, Germany and things German had become taboo. About this time, Hamburg Place in the Ironbound became Wilson Avenue. Simultaneously, the names of American presidents such as Van Buren, Adams, Jefferson, and Monroe became some of the best addresses in town. Even plain old sauerkraut got into the act, renamed liberty cabbage. In addition to the many musical compositions that appeared in Newark over the years, a body of patriotic songs was composed by Newarkers for the 250th anniversary celebration of 1916. Usually, they were fiercely sentimental in their praise of the place, perhaps somewhat silly by today's standards. Three of the best-known songs include 'Newark Knows How: A Souvenir Song of Newark's 250th Anniversary,' published by Smith and Ryan with words by J. Fred Smith and music by Louis Bobrecht. Its chorus stated: Newark you're a city of perfection, Newark, for you thousands hold affection. Good folks are ajourneying, they come from far and wide Come to celebrate the year to which we point with pride For 12 score years and 10 you've led them all. Others look to you in admiration. Even New York with its millions is jealously awed Admits she hasn't any traffic like Market and Broad This world watches everything you do Because you've shown that Newark knows how. 'While We Celebrate the Founding of Newark Town,' with lyrics by Ed. San Filippo and Joseph Woodruff, was published at 479 Broad St. Its chorus encouraged the observer: Picture and see, just the same as to me. Those dear old golden days; A pasture cool and sweet, Now known as Market Street, And Central Avenue, a little babbling brook, Where Broad and Clinton is standing now, Robert Treat once milked a cow. And Springfield was known as Lovers Lane. What would our forefathers say, If they could rise and look around. While we celebrate the founding of Newark Town. The song which stands up best to today's musical prototypes, and one which can still be sung with glee, is 'Take Me Back to Dear Old Newark: On Its Anniversary Celebration.' Composed by Arthur H. Weberbauer, the song was published by the Ellis Publishing Co. and sold at 147 Washington St. by Philip Rose. Here the listener is told: I've been all around this country, Stopped at every 'nook' and 'berg' From Frisco down to New Orleans, Palm Beach and Gettysburg; But none appeal to me so much as dear old Newark Town. I've tried in vain to like them all, Choo! Choo! I'm homeward bound. So, take me back, back to dear old Newark. To the town where I was born. Where I romped upon my Mother's knee, And through the field of corn (Chasing the chickens 'til the rooster hollered 'murder') Today it's a great city And I long for its Great White Way. Take me back, back, back, to dear old Newark On its Anniversary Celebration Day.